Spa-Rite Chlorine Free Pool Chemicals- No Salt, No Chlorine, No Odour! 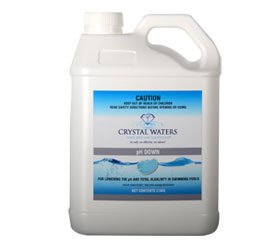 Crystal Waters is a chlorine and bromine free sanitising system for swimming pools. 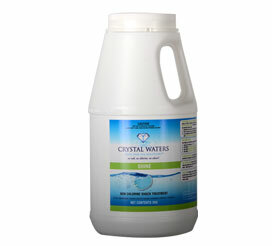 Crystal Waters is a proven system that is gentle for bathers without any odour or effects associated with traditional harsh chlorine and bromine treatments. Dosing is just a matter of adjusting the pH, Alkalinity and Calcium. Then simply add 60mls of Spa Sanitiser (per 10,000 Litres) and 50mls of Clarifier (per 10,000 litres) once a week. Once a fortnight add 50gms of Spa Boost (per 10,000 litres). Then it is just a matter of adjusting pH, Alkalinity and Calcium. Chlorine Remover I used to remove Chlorine and Bromine from water. Add when filling, refilling and topping up swimming pool. Pool Sanitiser is the heart of the chlorine free range and provides ongoing protection against harmful bacteria in your swimming pool. Add Pool Sanitiser weekly. 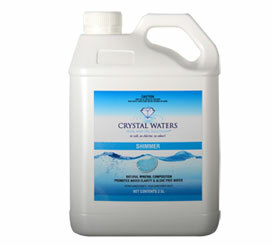 Pool Shimmer is a unique clarifier that works in harmony with Pool Sanitiser to provide exceptional water clarity. Add Pool Shimmer weekly. Pool Shine is a powerful non chlorine oxidiser that helps burn out impurities and body fats. Add Pool Shine once a fortnight. 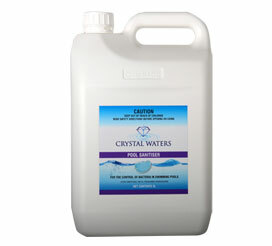 Pool pH Buffer used to increase the Total Alkalinity and pH. Add as required. 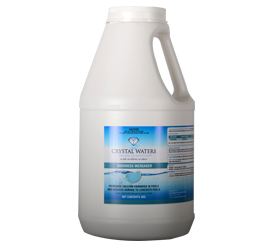 Pool pH Down is used to lower the pH and Total Alkalinity. Add as required. Pool Hardness Increaser is used to raise Calcium Hardness. Add as required. If you have just purchased a new pool or want to convert over to Crystal Waters then a start up kit would be the best way to go. We have a range of different packages available. 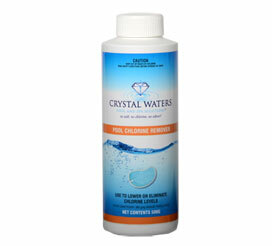 2.5L Pool Sanitiser, 2.5L Pool Shimmer, 2.5L Pool Shine, 500gms Chlorine Remover, 3KG pH Down, 8KG pH and Alkalinity Enhancer, Test Strips, Biguanide Test Kit, Spa Pad, Measuring Cup, Instructions. Please Note: Information based on pool of 50,000 Litres. 5L Pool Sanitiser, 5L Pool Shimmer, 5L Pool Shine, 500gms Chlorine Remover, 3KG pH Down, 8KG pH and Alkalinity Enhancer, Test Strips, Biguanide Test Kit, Spa Pad, Measuring Cup, Instructions. 2.5L Pool Sanitiser, 2.5L Pool Shimmer, 2.5L Pool Shine, 500gms Chlorine Remover, Test Strips, Biguanide Test Kit, Spa Pad, Measuring Cup, Instructions. 5L Pool Sanitiser, 5L Pool Shimmer, 5L Pool Shine, 500gms Chlorine Remover, Test Strips, Biguanide Test Kit, Spa Pad, Measuring Cup, Instructions.